The Zanzibari archipelago has historically occupied a crossroads of geography and culture, and it continues to do so in the 21st century. 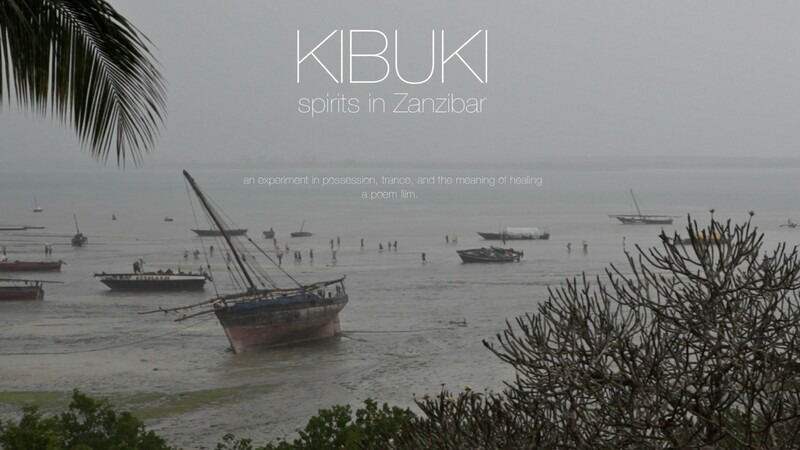 Despite the islands’ modernity and global connections, many Zanzibaris believe in the power of spirits to intervene in daily life, and mediums regularly consult spirits for guidance. The Kibuki are one of several recognized tribes of spirits. Kibuki practice focuses on ailments from social or psychological trauma that manifest in pain and suffering. The ailment is associated with possession by particular spirits that can be called and cajoled to release the sufferer. Kibuki circles are social networks, spiritual communities, and informal local businesses, and the ceremony of an initiate is at once a healing intervention and a source of entertainment. Although belief in spirit possession is relatively widespread, attitudes toward the practice are deeply ambivalent. The decision of a Kibuki circle to welcome a foreign initiate and to participate in collaborative filming brought all the principals into active exploration of the ambiguity of belief and the role of art in its expression. Kariakoo, Michenzani District, Zanzibar, 2008: During afternoon errands, Fatma, my host for a language study, suggests that we visit a show that is happening nearby, a Kibuki spirit gathering in a private courtyard behind the police station. Fatma’s seventeen-year-old daughter, Salma, has recently been diagnosed as the host of a sheitani, an inhabiting spirit that makes her ill. She will attend today’s ngoma, the dancing ritual that calls the spirit into an adherent’s head, but she will watch from the sidelines. A woman must be fully initiated before she can stand. Fatma and I pass through a makeshift curtain and enter a crowded courtyard. It is difficult to find a seat in the semi-circle of spectators. We are forced to the front, squeezing cross-legged on the red woven mats that form the stage, which is round, and lined on the far side with high-backed wooden chairs. Fifteen performers work the stage. Some rest, inexplicably sitting on top of one another despite empty chairs to the left and right. Most stand and spar in wild, kinetic gestures that move them back and forth across the dance floor. They dance rhythmically, throwing their shoulders. One brandishes a spear. Another is old and weary. She slumps in her wooden chair, and someone brings her a glass and a bottle of brandy. Another shoves a dancer and then falls to the mat. Their movements are exaggerated and theatrical, but not choreographed. At intervals, they swoop down upon us, the audience, to seize an exciting bauble: a necklace or a cell phone. We shriek and giggle, shrink back from the spirit, because the woman on the dance floor is not herself. Her head is serving as a chair for the sheitani, the Kibuki spirit who climbs a human host. The full essay is forthcoming in Afrika 3, Journal of the MAA. Please check back for updates. Learn more about Kibuki. Sign up for our mailing list, or follow our feeds to receive updates.